Almost ten years ago, the Cap'n and Professor Murder (now Dr. Murder) went to see The Life Aquatic with Steve Zissou, the first Wes Anderson film in two years, and the director's fourth film to date. While you could argue that with Rushmore and The Royal Tenenbaums, it was pretty clear what kind of design and filmmaking aesthetic Anderson gravitated towards, the concept of "Wes Anderson"-y movies had not yet really settled into the consciousness of his fans. Bottle Rocket wasn't quite clear - the result of a filmmaker with a distinct voice working on a relatively low budget - but Rushmore and Tenenbaums gave some indication of Anderson's meticulous approach to set design, camera movement, blocking, and hinted that he was putting together an acting "company" of sorts. The Life Aquatic with Steve Zissou was, from my perspective, the moment that Wes Anderson as an auteur crystallized, for better or for worse. Professor Murder didn't especially like the film, and after he begrudgingly agreed to see it a second time with another mutual friend, I could tell that realizing what a "Wes Anderson Film" was going to be from here on out wasn't thrilling to him. It's not even actually the most divisive film among Anderson fans - that seems to be split evenly between The Darjeeling Limited and Fantastic Mr. Fox - but it was the indicator that one shouldn't expect much of an "objective" reality in his universe from here on out. That, you could argue, was not the case for his first three films. From here on out, we would increasingly be taken to worlds uniquely of Anderson's creation, and you either were on board or you weren't. Skip forward (nearly) ten years, and Anderson is two years removed from Moonrise Kingdom and returning with The Grand Budapest Hotel, which may be the most "Wes Anderson"-y of his films yet. Already it's become something of a bellwether for casual to regular Anderson fans. While I am convinced that Anderson took advantage of some actual locations, the level of artifice on display is truly impressive, and Anderson's degree of control over every element now extends to the aspect ratio(s) of the film: one for each time period covered (1932, 1968, and 1985*). Inspired by the work of Austrian novelist Stefan Zweig, The Grand Budapest Hotel opens at the grave of an Author, tombstone covered in keys. A young woman sits down with her copy of The Grand Budapest Hotel, and our journey begins. The framing shifts (slightly) as we meet the Author (Tom Wilkinson) in 1985, dictating (or reading) the introduction to the book, and then flashes back to 1968, when a younger Author (Jude Law) is staying at the titular hotel, now largely abandoned and soon to close. By chance, he happens to be in the lobby chatting with concierge M. Jean (Jason Schwartzmann) and sees the reclusive owner of the Grand Budapest, Zero Moustafa (F. Murray Abraham). While chatting, Moustafa agrees to tell the Author the story of how he came into possession of the hotel. In the short span of ten minutes, we've already moved from 1.85:1 to 2.35:1, but the bulk of the film (spent in Zero's flashbacks) will be in the "Academy" ratio of 1.33:1. The Grand Budapest Hotel breathlessly moves from one event to another, all centered around young Zero (newcomer Tony Revolori)'s burgeoning career as the Grand Budapest's Lobby Boy, under the tutelage of M. Gustave H. (Ralph Fiennes). M. Gustave is the impeccably mannered, well dressed, and overly perfumed renaissance man about the Grand Budapest, able to deliver on any promise made to his clientele, and perhaps a few more for older women. One, in particular, Madame D. (Tilda Swinton) - and get used to it, Anderson operates mostly on first names with last initials, or none at all - who has a premonition of her death. M. Gustave thinks nothing of it until she actually does die, and at the outset of a possible world war, he and Zero travel to her home and encounter her unsavory children, who accuse him of murder. A murder mystery is underway, and one that Gustave must prove himself innocent of if he hopes to ever see his inheritance, the painting "Boy with Apple" - a late addendum to Madame D.'s Will. To say much more would ruin the fun of what is, in essence, a Wes Anderson version of a screwball comedy. There are arguably more characters in The Grand Budapest Hotel than Moonrise Kingdom, introduced at a rapid pace, and some dispatched just as quickly by Jopling (Willem Dafoe) the henchman of Dmitri (Adrien Brody), Madame D.'s greedy son. Dafoe is playing the human version of his character in Fantastic Mr. Fox, but one prone to more bursts of extreme violence. This may, in fact, be the most violent of Anderson's films, not merely limited to what we do and don't see but to the suddenness of it. If dog lovers were shocked at Moonrise Kingdom, cat lovers may well be surprised by a (pun fully intended) throwaway joke involving Jopling and a Persian in the office of Deputy Kovacs (Jeff Goldblum), the assigned Executor of Madame D.'s estate. It leads to something arguably more shocking involving a door, and a bit of misdirection about the fate of Zero's girlfriend, Agatha (Saoirse Ronan). It might be fair to say that the violence, like everything else, is exaggerated in The Grand Budapest Hotel. Anderson's use of miniatures, a fixture in one degree or the other since The Life Aquatic, is more apparent this time, in particular during transitional scenes. In some instances, like the rail car to and from hotel, it isn't quite as noticeable, but for an extended period in the film (from the observatory to the end of the ski chase sequence), it's almost distractingly obvious. By the same token, this is the world Anderson is creating, one slight more heightened and appropriate for a screwball comedy. That said, it's inherent artificiality might be off-putting to fans of Anderson who prefer some degree of reality to balance the picture. This may be at the heart of why The Darjeeling Limited is so divisive: Anderson brings his fastidious shot construction to real locations and finds the delicate balance, one not readily available to him in the manufactured interiors of The Royal Tenenbaums. Moonrise Kingdom and Rushmore, for me at least, find the best balance, but it really does depend on what you gravitate towards Wes Anderson films for. The shot composition is, as always, impeccable, and Anderson's ability to adjust the shifting aspect ratios without compromising his attention to detail is admirable. 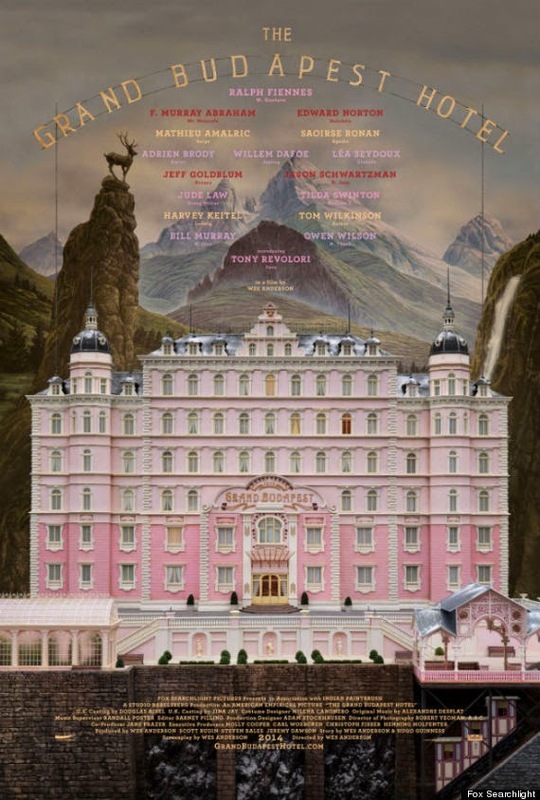 The Grand Budapest Hotel is a marvelous film to look at, even as the gimmickry draws attention to itself. For the most part, the film is set in 1932, so it's not terribly distracting, but it's hard to argue that the ratios are there for anything other than their own sake. The 1985 and 2014(?) sections are so brief that they barely merit their own, separate ratios. None of this would really be noticeable if it were in service to the story, or that the story were enough to speak for itself, but Anderson and Hugo Guinness (the voice of Bunce in Fantastic Mr. Fox and Eli Cash's surrogate painter) constructed a story of interesting characters, if not a particularly compelling narrative. Not to do a disservice to the excellent cast (and I'll get to them in a moment), but the "mystery" of The Grand Budapest Hotel is never really a mystery, as we know almost immediately what happened to Madame D., who did it, and why. The only thing we don't know is why exactly old Zero is so reticent to talk about Agatha, and the resolution to that is almost a throwaway line of narration near the end. It is a fine film to watch, and great fun to see in the execution of its structure, but The Grand Budapest Hotel lacks a certain something, an intangible quality to the story that resonates. I'll certainly watch the film again, and the characters are more accessible than those in Darjeeling (or even The Life Aquatic), but Moonrise Kingdom and, in particular, Rushmore had a more lasting impact after the first viewing. Having been slightly deflated by the window dressing surrounding a mostly empty room, I cannot in good conscience tell you that is in any way due to the cast. To a person, The Grand Budapest Hotel's dramatis personae brings everything they have to even the smallest roles. This includes Bill Murray, who is barely in the film but makes an impression beyond his handlebar moustache as one of the members of the "Crossed Key Society," who to say anything more about would do a disservice to the second half of the film. The Society includes a few other Anderson alumni, as well as a newcomer to the Anderson Players, but a familiar face and welcome addition. If you're looking for Anderson regulars, you'll find almost all of them (no sign of Luke Wilson, but Owen pops up), including new additions from Moonrise Kingdom: Edward Norton, Harvey Keitel, and the aforementioned Tilda Swinton all play important roles in the story. Swinton, as I understand it, came in to replace Angela Lansbury when scheduling conflicts prevented the latter from playing Madame D., and she isn't in the film much but makes quite an impression with some very good old age makeup (seriously, if there's such a thing as the opposite of Guy Pearce's Prometheus makeup, this is it). I was a bit surprised to hear that the initial casting of Johnny Depp was for M. Gustave, as I honestly can't imagine him in the role. He's more suited for Dmitri, and not just because Adrien Brody's physical appearance in the film resembles Depp's, but M. Gustave H. is such a tightly wound character that it wouldn't make sense. That brings us to the final - and perfect - choice for M. Gustave (as odd as it might seem): Ralph Fiennes. Conceptually, I suppose it sounds odd that Ralph Fiennes is in a Wes Anderson film, particularly one as silly as The Grand Budapest Hotel is, but in execution he's a marvel. Fiennes brings a level of distinction that is sharply at odds with M. Gustave's profane outbursts later in the film. His performance is hilarious not merely because you wouldn't expect it from him, but that he commits to the character so deeply that you never doubt he IS M. Gustave. Paired for most of the picture with Tony Revolori - himself an excellent discovery - Fiennes inhabits the screwball spirit of Grand Budapest and is easily the high point of the film. Even if you're lukewarm on Wes Anderson, I would easily recommend The Grand Budapest Hotel just for Fiennes and Revolori. I will openly admit to a giddy sensation during the beginning of The Grand Budapest Hotel, as I often have when seeing a Wes Anderson film for the first time. As the film went on, I alternated between admiration for the technical aspects of the Auteur and realizing that I was more impressed with the story than I actually enjoyed it. Don't get me wrong, this is not a film that's a chore to watch, nor does it ever drag, but The Grand Budapest Hotel didn't grab me in the same way that some of Anderson's films do. I would be hard pressed to call this a "lesser" film in his catalog, but I can see why it might end up being another dividing line, as The Life Aquatic with Steve Zissou was. I concede that, for the moment, The Grand Budapest Hotel is a (very entertaining) exercise in form over function. Is it possible that changes the next time I see it (and I will)? Quite possibly. The Cap'n is predisposed to follow Wes Anderson down the rabbit hole - less so his imitators - but it's hard to argue that this is not his most "Wes Anderson"-y film to date, for better or for worse. * The film opens and closes with a book-end section about a girl visiting the Author's grave, which one might safely assume takes place in the present, but it seems to have the same aspect ratio as the 1985 scenes.